Official Holiday Ops details have now been released, and I wasn’t to far off from getting them all correct on my previous articles. Mission Reward Crates will contain Decorations, Normal or Premium Consumables or Credits, but the Gift Crates will contain better prizes, for example, Gold, Garage Slots, Emblems and even Premium tanks. Players will be able to buy Crates for themselves or send them as Gifts to their friends. If you want to try your luck, you might have a chance to win a one of the following Premium tanks: Type 59, Skorpion G, T26E5 or a Lorraine 40t. 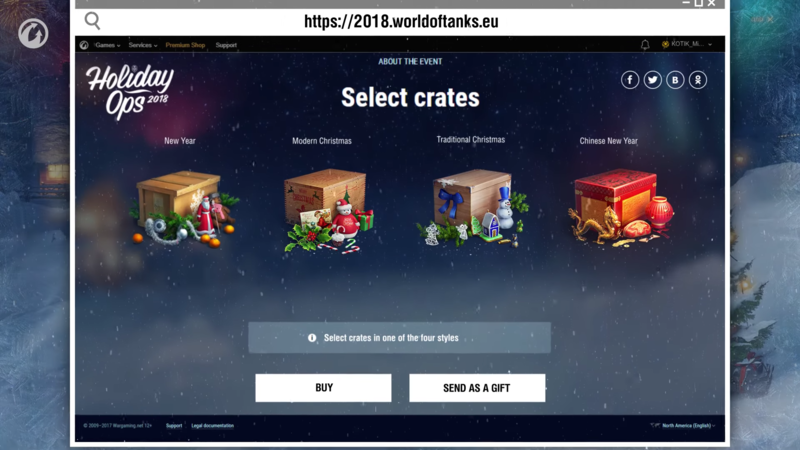 Please remember, buy these crates responsibly, do not give into the temptation of spending a fortune just to try and get a Premium tank. You will always get something worth your money, but these loot crates are an easy way to spend a lot of money in a few minutes. The festive storm hits servers Dec. 15 at 05:00 UTC. Set aside whatever errands you had and focus on decorating and spreading cheer. Your Garage is (erm) gone, blown away with ice-cold wind. Don’t get upset, though. Instead, there’s a winter yard dressed up in fairy lights, tinsel, and a dusting of snow. It looks charming indeed, but is lacking in decoration. That’s where you come in to bring merriment and holiday spirit, all while earning delicious, delicious rewards. Craft snow into a snowman, and adorn the house, lampposts, and the tree to increase your Festive Atmosphere (here for a step-by-step guide to decorating). Choose your decorations wisely, though. They come in all shapes and sizes, and are arranged in five groups by rarity. Level one items are the easiest to get; level five decorations are really rare to come by. The rarer the decorations you use, the more points they add to your Festive Atmosphere, and the faster you ascend a level. What’s Festive Atmosphere? If you took a look at Holiday Ops last year, “Festive Atmosphere” must ring a bell. But here’s a refresher just in case: Festive Atmosphere has ten levels and defines your progress in decorating the yard. You can check your current progress at any time by clicking a snowflake icon below the Garage top menu. The first time you step up a level, a crate full of in-game items drops down in the center of the yard. In fact, we’ve already stashed a Level 1 crate with a gift tank right under the tree. Log in to claim it when the event starts! Make it up to the top, and you’ll collect a bounty the old man in the North Pole could never fit into his sledge: a four-person female Crew, discounts on researchable vehicles, a host of consumables, and a set of Holiday Ops medals. To check the rewards you’ve collected so far, click the snowflake icon and then the “List of Rewards” button to its left. Important Note: Discounts can be used for absolutely any researchable vehicle of the specified tier (crates provide discounts for a specific tier each) and aren’t limited in time. Once you pick a tank you’ll be buying with it, it’s valid until you purchase it. Grab it right away or in a year—you’re still getting that sweet amount off the price. The time for picking a tank expires mid-March, though. So don’t put it off for too long! The same applies to your new Crew members: make sure to recruit them before mid-March 2018. We’ll share the exact date later, so stay tuned. Decorations don’t just help you level Festive Atmosphere. Collecting them earns you exclusive emblems and inscriptions and a special Holiday bonus that increases the amount of XP, Crew XP, and Credits earned per battle. This year, you have absolute freedom to decorate just about everything you see: the snow-capped country house, lampposts in the yard, and the holiday tree. Also, don’t pass on the snow: it’s waiting for you to craft it into a snowman! If you want to try something new this year in terms of decor but aren’t exactly sure what, Holiday Ops 2018 has a selection of designs for you. Go with the Modern Christmas set if you gravitate towards a contemporary holiday design. Do you like this idea, but prefer a more classic holiday color scheme? Just try the Traditional Christmas design. If you have no attachment to this whole “Christmas” thing, check out the Chinese New Year or Soviet New Year sets. Remember, this isn’t an ironclad template, rather a source of inspiration to get you thinking! Choose a set and stick to it or mix and match—designs are only limited by your imagination and creativity. Hover over elements that can be decorated, click the snowflake right below the Battle! button or click individual elements for a close-up view. Use the panel to the left, in the close-up view, to navigate between interactive elements. You can’t decorate randomly: interactive elements have designated slots for each type of items. To begin, click the Garage element you want to adorn. Then click a slot that can be decorated to open a window with all decorations suitable for it, and choose one to apply. Use the filters in upper right corner of the window to sort decorations by levels and design collections. Decorations come in all shapes and sizes, and are brought together in four design collections: Traditional Christmas, Modern Christmas, Soviet New Year, and Chinese New Year. From all kinds of baubles, ornaments and garlands to tree toppers and twinkling fairy lights, there’s a little bit for everyone’s aesthetic this year! What’s more, each design set injects the scene with extra holiday vibes through unique background music. The more items from a certain set you use, the more it manifests itself. All acquired decorations are listed in special albums. Click the snowflake under the Battle! button and choose Collections (to the right) to view all four albums. They show your progress towards getting a full collection and offer a sneak peek at the items you don’t have yet. Newly earned decorations are added to albums automatically and stay there for good, whether use them for decorating or crafting new items or not. Collections aren’t just a navigation tool to help you with redesigning your Garage—they can net you bonuses, an exclusive customization style*, emblems and inscriptions. Keep in mind that each collection grants these items to particular vehicles. Go with the Soviet setting, if you’re looking to customize USSR tanks. Enjoy playing Chinese vehicles? Then collect Chinese New Year decorations to receive emblems and inscriptions for them. Completing the Traditional Christmas collection nets you customization items for German, French, Polish, and Czechoslovakian tanks. Stick with Modern Christmas if you’d like to roll classy in American, British, Japanese or Swedish vehicles. *The style is applicable to Tier VIII Premium tanks and all Tier X vehicles. Customization items: Completing any of the four sets will land you exclusive customization style, emblems and inscriptions for a certain nation (Soviet and Chinese New Year) or a group of nations (Traditional and Modern Christmas). There are no limits here. Collect all four sets to get a set of items and bonuses for each nation! Holiday bonus: Your road to assembling a full collection is spiced up with per-battle boosts to XP, Crew XP, and Credit earnings. These boosts increase as you fill in the sets, but you get the maximum bonus way before completing a set. Want to get the most of this bonus? Here’s a trick, and it’s as simple as it gets: decorate the Garage to reach the maximum Festive Atmosphere level. Solid progress on collections combined with Level 10 Festive Atmosphere lends you +48% to XP, Crew XP, and Credit earnings per battle. Playing with Premium Account status? Here’s the good news: the Holiday bonus is cumulative with Premium benefits. Essentially, maximum Festive Atmosphere, Premium Account status, and The Holiday Bonus net you nearly double the amount of XP, Crew XP, and Credits per battle throughout the event. You can check your current bonus for the selected vehicle at any time. It’s displayed right under the Battle! button and in the Collections window. Decoration are earned through special boxes from completing Holiday Ops 2018 Marathon missions. Another way to obtain them are the Advent Calendar daily quests that open during the event. Also, you can bring out your crafty side and create decorations with the Large Holidron Decorider or stock up on dazzling items on a special website. Visit it starting Dec. 15 to enrich your collection and find gifts for fellow tankers! Holiday Ops 2018 will have all the tank-slaying-battle-raging frenzy you’d expect from World of Tanks. However, this time you can choose between battling for fun’s sake or duking it out to earn decoration boxes. If you go decoration hunting, check out 11 battle missions from the Holiday Ops 2018 Marathon. They get updated weekly and can be completed several times. Completing each rewards you with a decoration box. What’s in it? Three decorations and a little something extra. Prepare to be surprised! You never know what’s inside: consumables or maybe Credits. Destroy at least two enemy vehicles in a battle. Destroy at least two enemy vehicles of two different types. Cause at least 1,500 damage in a battle. Damage or destroy enemy vehicles’ internal modules or injure members of their crew, totaling at least 2 modules and crew members in a battle. Block damage that is equal to the durability of your own vehicle in a battle. Only battles, where the player causes damage to at least one enemy vehicle are counted. Only battles when the player is among the top-10 by experience earned are counted. Cause 50,000 damage within an unlimited number of battles. Completed a mission? Go ahead and open the “congrats” dialogue window to check out what you’ve earned. Don’t feel like opening it right now? No big deal. You can do it later. Just click the box icon in the lower right corner of the Garage and choose which one you’d like to open when you’re ready. Along with 24-hour-only deals, the Advent Calendar 2018 offers daily battle missions. Completing them during the Holiday Ops 2018 event nets you a decoration box. Check the Calendar out by hovering over the newsstand in the wintry Garage, take up challenges, and increase your decoration collection! Decoration crafting caused a lot of discussion in your ranks last year. We took notice and went back to the drawing board to design a whole new machine for the job. Yes, you heard right. It’s a machine indeed—the Large Holidron Decorider, and it follows your requests to the letter, when making decorations. Here’s how it works. Let’s say you have a few charms, garlands, or baubles you don’t feel like using. Don’t let them lie there and gather dust—smash ‘em. Then, put the shards into the Decorider and make a wish. Well, not literally—simply set the parameters (level, shape, and collection) for a decoration you really want, check if there are enough shards* to fulfill your wish, push the Craft button, and voila! Don’t have anything in particular on your wish list? Let the Decorider surprise you—pick “Random Collection” and get right to crafting. Having a hard time finding gifts? Don’t worry: we’re here to help by taking the pain and effort out of your holiday hustle. Check out our Holiday Ops 2018 website (only available for the duration of the event), if you want to do some good this festive season. It offers a selection of gift boxes with decorations* and valuable in-game items to treat fellow tankers, friends, and even yourself. We stuffed them with all kinds of goodness from Premium consumables through to Premium vehicles, including the Type 59, Lorraine 40t, Rheinmetall Skorpion G and ?26?5. Gift boxes might save you some time in building a collection. However, there’s no need to stock up on them to get the maximum Festive Atmosphere level — keep on battling and you’ll reach it with decorations obtained through battle missions! is it me or nobody said the price for the boxes ? We don’t know them yet. I like how they have balls to release lootboxes after Battlefront 2 fiasco. Screw lootboxes. I really haven’t played Battlefront so I don’t know exactly how the lootboxes works there, but is it the same principal? I mean I remember last year you paid some euros and in return you got some decorations and if you were lucky you also got a tank or something. well, WoT lootboxes are actually a fair deal as long as you need gold. Probably one of the best deals this year when it comes to value for money, people are all over reporting to have gotten way more than regular price. Sure you might not get the premium tanks, but you’re practically guaranteed that you’ll get gold exceeding the price of the boxes. Nobody said Wargaming is any better than Electronc Arts. They aren’t. Yes but even EA backed off after while. We had them last year, and we recently had this on World of Warships. Yes but last year it was only decorations as far as I remember. And I don’t follow WoWs at all. I’m not sure if we’re talking about the same event, but the one I remember also had premium tanks. Even if the community would bring up a shitstorm. WG wouldn’t give a damn and most of the customers would still buy enough of these boxes to get every person at WG two golden Bugattis. Chance for Hype 59? People will buy tons of these stuff to get this irrelevant bunch of pixels. Who gives anything about reputation or happy customers as long as you make money? Battlefront’s community managed to get EA to back off. So it really isn’t impossible. These arent progression based loot boxes AND they AREN’T gambling because u always get something for the money u spend. just not the tier 8 tank or ship in every box. If I have all the prem tanks from the boxes not including type 59, there chance I will get duplicates? Or the chance to get type 59 higher? No idea, but I don’t expect it to give you any better chances. I was told this is totally random. This is called Gambling in Australia! In several other countries as well. This isn’t Gambling, because you get the same or more value in goods in return. Gamble would be considered you paying 50€ and getting nothing or a very low valye item that is worth less than what you paid. No, he’s talking about the new laws being introduced in several countries (Belgium as well) about lootboxes. They state that as long as you don’t know exactly what you will get for your money, it constitutes gambling. Not all of the laws have been finalized yet, but that’s basically it. So you buy surprise boxes on eBay is also gambling now? That definition doesn’t really ring true. The definition is based on the thought that there is significant chance for addiction and one might spend more than they should. And even though everything in a loot boxes might be of similar intrinsic value, not everyone will want the same thing. Take this event for example. How much money are some people going to spend just to get that Type 59? It might be as few as two/three boxes, but it could be 20. I guess it won’t be possible to gift the tanks after you opened the gambling boxes? Call me crazy but I don’t need the Hype 59, but a friend of mine wants it really bad. Depending on how much the boxes cost, I will probably buy some (no more than 4/5, but once again, depending on the price). It’s not worth buy hundreds of them just to get a premium tank, which you can buy from time to time with the money you’ve spent on the boxes. Other than that, seems like last year but better overall since the rewards are not strict to one specific tech tree line (like last year’s IKEA tanks only). All the discounts, boosts, female crew and personal reserves (and credits) will become handy to buy and equip few tanks I have in mind. Bought 25 boxes, in the 20th box I found Type 59, in the last box I found Patriot and overall I have received 15K gold, 2x IV premium tanks, 20 garage slots, 14 days of premium account. 5.99€ 3 boxes! You can’t buy a single box at least on EU. Opened 16 boxes total and got a Type 59, so that happened. I also got a Type 59 out of these crates, plus 5400 gold and 8 days of premium plus other small stuff. The price i paid was totally worth what I got. Important note: I actually dropped the Lorraine 40t three times, but apparently the game replaces it with another tier 8 tank reward from the prize pool if you already got this particular one. I’m assuming that since I already own a Skorpion G., once I dropped the first Lorraine, the game gave me the only two tanks from the prize pool which I didn’t have in my garage, yet. Verdict: if you need gold, it’s a no brainer, the value is outstanding. If you are are not, then not so much, especially if you aren’t lucky enough to get a couple of tier 8. Good luck everyone, and a happy Christmas :)? The new preset camo you get through the event scrapbook wont go on to the new French heavies 🙁 and yes I do have the Traditional Christmas book complete. Each scrapbook reward skin is bound to certain nations, determined by the scrapbook you’ve completed. 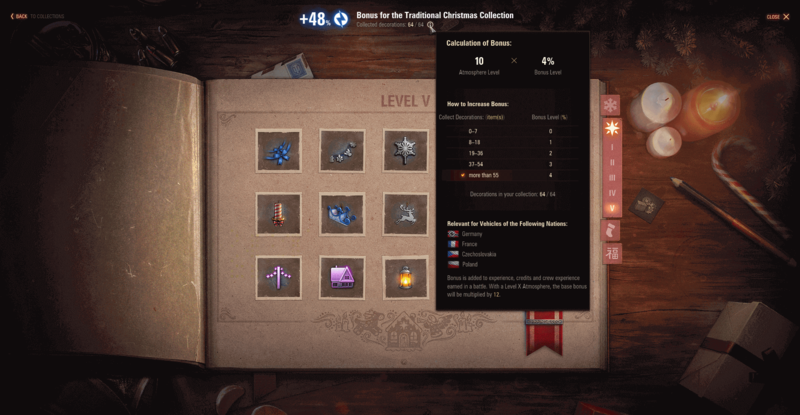 You can only apply the reward skin of the Chinese Christmas book to a Chinese vehicle, iirc. If you want to get the Christmas camo to apply on a French tank, you need to complete the “Traditional” decoration book. Hey guys I just have 1 important question for this event, could you keep the not selected reward female crew after the event? Will she stay or I have to select her before event ends? Hey Peter, you have until mid-March (exact date TBC) to select your female crew members.